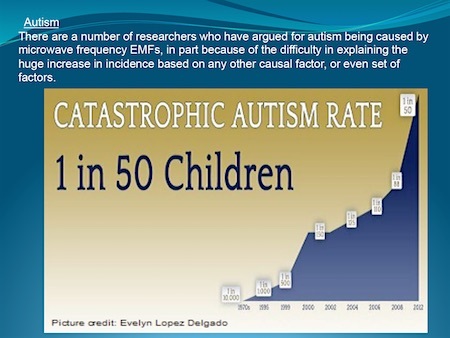 The number of children diagnosed with autism has exploded from one in 10,000 several decades ago to one in 68, according to Centers for Disease Control & Prevention. Among those searching for reasons for the explosion are Rep. Dan Barton (R-Ind. ), who calls it “worse than an epidemic, an absolute disaster,” and Rep. Carolyn Maloney (D-New York), representing much of the East Side, who blames it on excessive vaccinations of children. Autism is defined by CDC as a range of functional disabilities including lack of social skills, intellectual disability and language impairment. Victims may engage in repetitive movements or unusual behaviors such as flapping their arms or rocking from side to side. Maloney, addressing a hearing of the House Oversight and Government Reform Committee, said she could not accept increased diagnosing of the syndrome as the reason for the jump. She has asked CDC to investigate further. The answer, according Martin Pall, Ph.D., biochemistry, of Washington State University, is microwave electro-magnetic radiation fields from routers, cellphones, computers, wireless iPads, cell towers, wireless utility meters and other sources. U.S. classrooms from the earliest grades are normally equipped with Wi-Fi systems and many children have their own cellphones. Pall has authored a 42-page analysis of the biology involved when the body interacts with pulsed microwave radiation. “Electro-magnetic fields act via activation of voltage-gated calcium channels to produce beneficial or adverse effects,” the paper says. The microwaves “induce biological impacts at non-thermal levels, supporting a paradigm shift for microwave/lower frequency electro-magnetic field action,” it says. The paper is illustrated with many diagrams and graphics to show the points that Pall is making. Retired Canadian Army Captain Jerry Flynn says an “explosion of autism” in children in Canada appears to mirror the explosion in wireless technology. He wrote May 22 to Prime Minister Justin Trudeau and members of the Canadian Parliament that the rate of autism in children in the U.S. was one in 25,000 before 1970. In 1970, he said, it had climbed to one in 2,500; in 2000, one in 150, in 2004, one in 125, in 2008, one in 88, and in 2013, one in 50 and one in 27 in populated cities. Quoted are statistics compiled by the Australian ADHD Foundation.